"We do whatever it takes to come out on top." 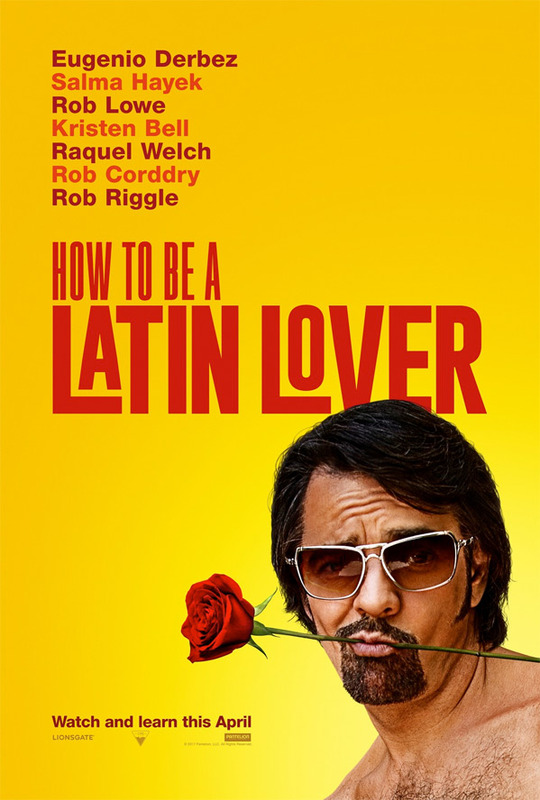 Pantelion Films has debuted another new official US trailer for the film How to Be a Latin Lover, a comedy from Ken Marino starring Eugenio Derbez (seen in Jack and Jill, Miracles from Heaven, The Book of Life). This new trailer isn't much better than the first trailer, but they're hoping to find an audience anyway. Eugenio Derbez stars as the titular "Latin lover" who is dumped by the wealthy older woman he was with and is forced to move in with his sister - who is played by Salma Hayek. While living with her, he bonds with her nerdy son, Hugo, played by Raphael Alejandro. The rest of the big ensemble cast includes Kristen Bell, Raquel Welch, Mckenna Grace, Rob Lowe, Michael Cera, Michaela Watkins, Rob Corddry, Rob Riggle, Rob Huebel & Renée Taylor. Enjoy. In this laugh out loud comedy, OR In this riches to rags story, Eugenio plays a very handsome and very young Maximo who has a dream to be rich without ever having to work a day in his life. Having made a career of seducing rich older women, he marries a wealthy woman more than twice his age. 25 years later, spoiled and bored from waking up next to his now 80-year-old wife—he gets the surprise of his life when she ends up dumping him for a younger car salesman. Forced out of his mansion and desperate for a place to stay, he must move in with his estranged sister, Sara, (Salma Hayek) and her nerdy but adorable son, Hugo in their small apartment. Anxious to return to the lap of luxury, Maximo uses his nephew’s crush on a classmate to get to his new target—her grandmother, Celeste, a widowed billionaire. As Maximo tries to rekindle his powers as a Latin lover, he finds himself bonding with his nephew Hugo, and he begins to learn that being a Latin lover means that loving money isn’t as important as the love of your family. How to Be a Latin Lover is the feature directorial debut of actor-writer-comic Ken Marino. The screenplay is by Jon Zack & Chris Spain. Pantelion Films will release in theaters starting April 28th, 2017.